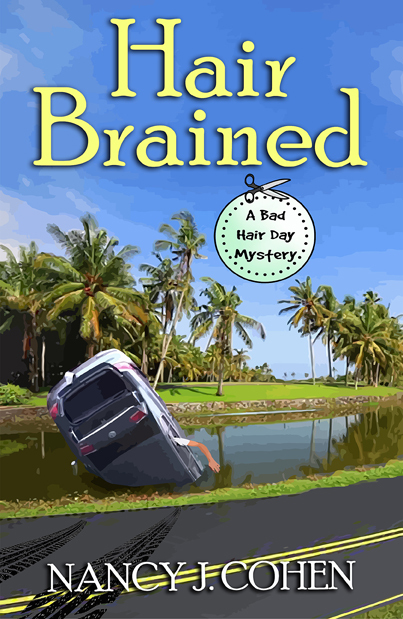 Florida Book News: HAIR BRAINED (Bad Hair Day Mystery #14) is now available for pre-order in ebook format. HAIR BRAINED (Bad Hair Day Mystery #14) is now available for pre-order in ebook format. When hairstylist Marla Vail’s best friend is hurt in a car crash, Marla takes over as her baby’s guardian. No sooner does Marla say, “Baby want a bottle?” than she’s embroiled in another murder investigation. Her husband, Detective Dalton Vail, determines the crash may not have been an accident after all. But then, who would want Tally—or Ken in the car with her—out of the way? Ken’s insurance agency was involved in a fraud investigation. Did someone mean to silence him? Or could something in Tally’s life have put her in jeopardy? She’d recently joined a tea ladies circle. Had she discovered secrets among the women that almost got her killed? Or could she be the target of a disgruntled employee from her dress shop? As Marla delves further into her friends’ backgrounds, she realizes she didn’t know them as well as she’d thought. Even so, Tally and Ken have trusted her with their child’s care. Can she protect the baby and find the culprit before someone else becomes roadkill?